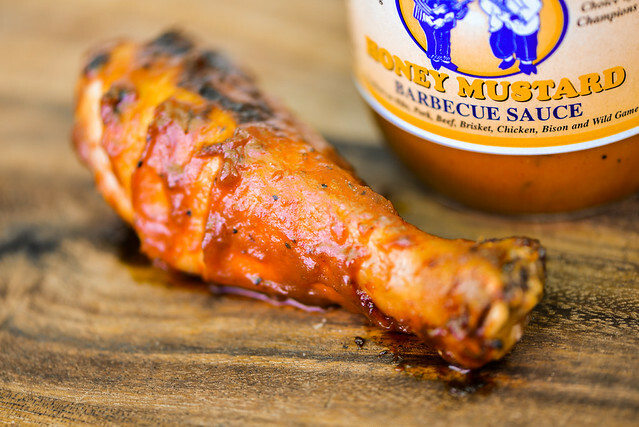 Blue Hog Honey Mustard BBQ Sauce retains the great layers of flavor of it's tomato-based brothers, but the pungent mustard overpowers those waves of vinegar, Worcestershire, garlic, and pepper possibly to a fault. While at the Kingsford Invitational, Ron Gray of Pellet Envy gave me a nice surprise—a bottle of homemade Blues Hogs straight from the source. I've yet to crack that open, and since it's not available in the stores, I doubt I'll give it a review, but it did remind me I had a bottle of Blues Hog Honey Mustard sitting in the fridge waiting for a proper write-up. 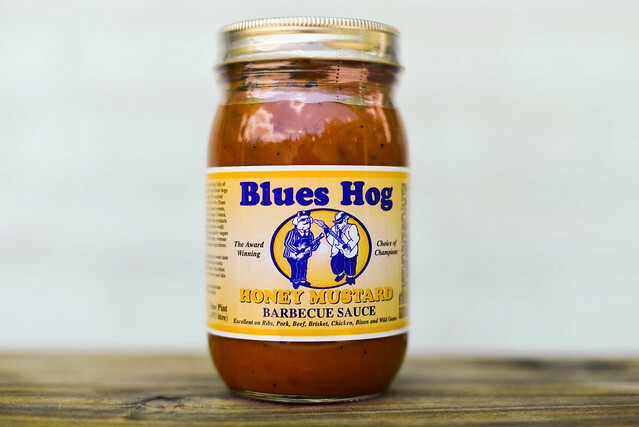 Blues Hog consists of three sauces originally cooked up by Bill Arnold of the award-winning Blues Hog Cookers team. His background in competition barbecue made his sauces well tailored to create barbecue that a judges irresistible. I've already covered the original and Tennessee Red, so this is the last stop in the Blues Hog line for me. 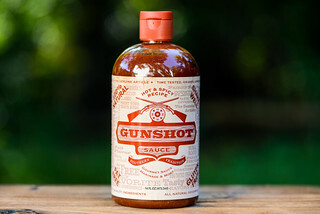 You get what the bottle promises in the aroma department—a sauce that smells pretty much like straight honey mustard. The pungent bite of mustard is lessoned by a strong honey, giving it a sweet and spicy aroma. 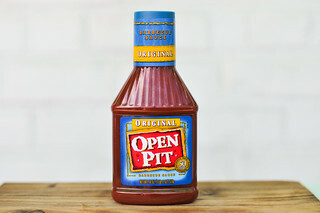 There's a light vinegar tanginess that mixes in, along with the distinct smell of Worcestershire lingering in the back. 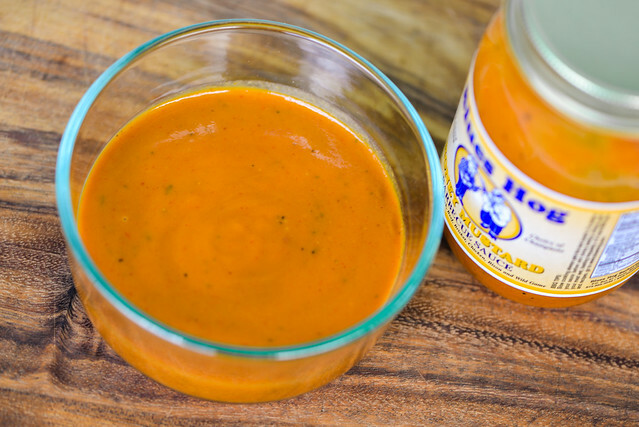 Blues Hog Honey Mustard weighs in at a solid medium in thickness and has pour that starts out heavy and even, but slows to a few final drops of sauce and leaves a medium coating left clinging to a spoon. It's opaque, but its orange-yellow hue is light enough that you can easily the sauce has a nice amount of black and red pepper from all the specs that dot the surface. The smell is a bit deceiving, because on first taste you get a whole lot of mustard and only a little honey. That sweetness in the aroma is backed down by the flavor of mustard, which gives the sauce a strong bite right at the start. As the sauce settles on the tongue, whatever light sweetness that was there is overtaken by vinegar, which only seems to further the pungency of the mustard. Giving it a second go around to pick out other components, some players of the other Blues Hog sauce start to come out like garlic and Worcestershire. The sauce ends with the addition of a light chili heat that intensifies the burn that was started by the mustard and then ramped up by vinegar. The sauce coated the chicken well, but didn't bake down great over indirect heat. This caused some burn-off when the sauce was sent over to direct heat, and I added an extra brushing at the end to ensure the leg was well sauced enough for the review. There wasn't much in the way of caramelization, but instead the sauce slightly burned over the hot coals. Mustard remaining the prevailing flavor off the grill, but a little extra sweetness lessoned its harshness. I got a slight tanginess from the vinegar, but some of the more nuanced flavors out of the jar were lost on the chicken. Blues Hog Honey Mustard certainly delivered on the mustard, possibly to a fault for me. It had the layers of nice barbecue flavors I've come to expect from Blues Hog, but the mustard's pungency drowned them out a bit and overpowered other pieces of the sauce. When it comes to mustard sauces, I side more with the sweeter versions, but I could appreciate the depth and strength of this sauce and I think real mustard lovers would appreciate it. The sauce was more robust out of the jar. While it lost some depth after being cooked, it also scaled back the harsh mustard flavor with extra sweetness, so I think either application has its strengths and weaknesses. 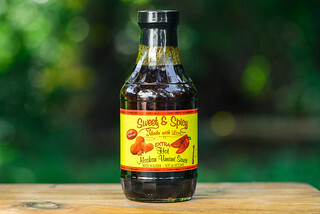 It's well suited for mustard loving pork—either slathered on ribs, spread on a pile of pulled pork, or smothered on pork chops.